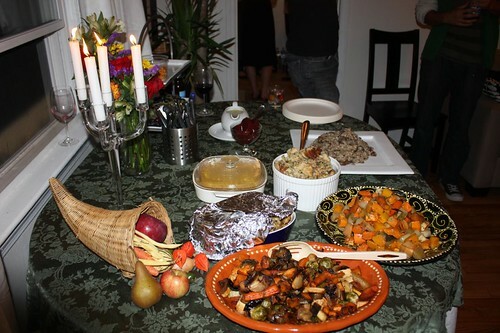 On Sunday we hosted the first Canadian Thanksgiving in our new place. Aside from the difficulty of preparing the meal with only nine fingers and an unexpectedly exploding Pyrex dish it was a tremendous success, and a great turnout. The menu was simple due to the quantities of food necessary and the lack of appropriate digits to prepare said food: brined, herb roasted turkey; wild mushroom risotto; roasted vegetables; mashed potatoes; stuffing; sweet corn tomalito; and cranberry sauce. 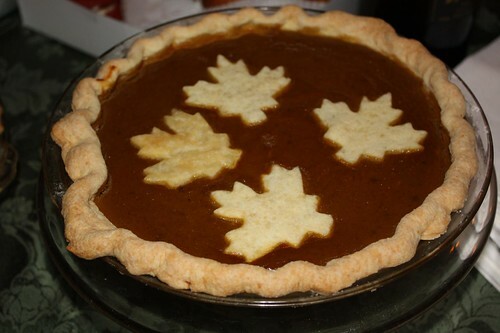 For dessert Jen made her maple leaf pumpkin pie and our guests brought a wide range of desserts including cookies, apple crisp, apple pie, whoppie pies, pecan pie, and brownies. Typically tonight's meal would be hot turkey sandwiches, however, our turnout was so good for Canadian Thanksgiving that we had nearly no leftovers. Only a tiny plate of stuffing was left which made for a somewhat bizarre dinner last night. 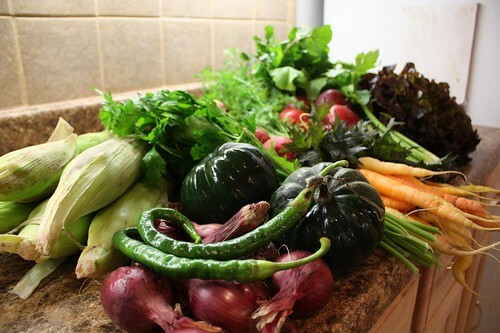 Today's farm share pickup consisted of: Lettuce, corn, carrots, komatsuna, parsley, squash, arugula, celery, chilis, onions, Empire apples and Jonagold apples. 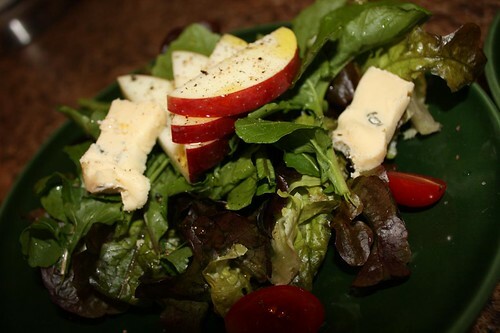 I used the immediate delivery to make this salad with leftover Blue Bavaria cheese and apples. 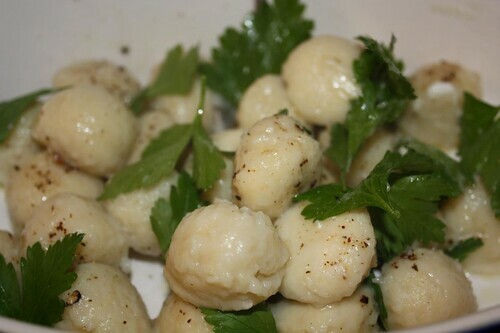 For the main course I made some potato gnocchi with olive oil and torn parsley leaves. This parsley was likely the finest proof that the old myth that parsley has no flavor is a load of crap. 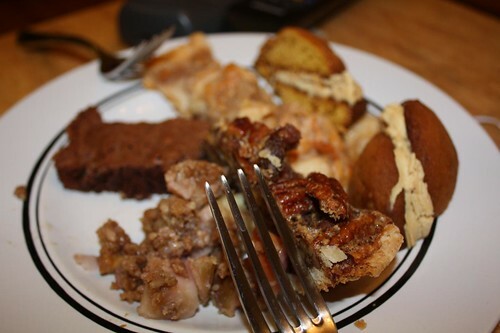 One of the best things of the aftermath of the holiday is having a huge variety of desserts to enjoy after dinner. The only thing that could really make it better would be if a little man pushed around a cart and we got to select all of these various items from off of it.